You guys: The Los Angeles Lakers are BACK! It's been hard to keep track of whether the Lakers were done or back this season, after they struggled to a 1-4 first start to the season, then restarted the season by firing Mike Brown, then staggered for like a month and a half of Season No. 3 under new coach Mike D'Antoni, then got consecutive Ws after D'Antoni lit the candle on Season No. 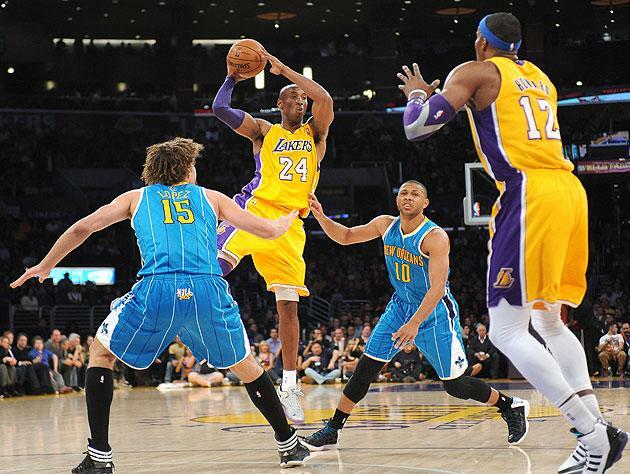 4, then dropped three straight that led Dwight Howard to break the seal on Season No. 5. But after three wins in a row, it seems very safe to say that the Lakers are now BACK. The latest proof: L.A.'s 111-106 win over the New Orleans Hornets on Tuesday, a game that saw Howard play aggressively in the paint on both ends (a team-high 24 points, five steals and four blocks), dusted-off forward Earl Clark continue to play well (20 points on 11 shots, 12 rebounds, four assists) ... and Kobe Bryant continue his transformation from scorer to facilitator. After averaging more than 24 field-goal attempts and just 4.2 assists per game over a monthlong stretch that saw L.A. go 5-11, Bryant has switched up over the past three games, taking just 34 shots while dishing 39 dimes in the trio of wins, the most in any three-game stretch during his 17-year NBA career. As ProBasketballTalk's Kurt Helin noted, Kobe running the show while Steve Nash works off the ball, Clark and Antawn Jamison park in the corners to space the floor, and Pau Gasol and Metta World Peace sit on the bench stewing and brainstorming pranks wasn't exactly the vision hatched this summer, but it seems to be working — especially the "Kobe at point guard" part. Reporter: Is this is as enjoyable, what you're doing now, where scoring is second? Yeah, because you're seeing everybody else gain confidence from it, play well off of it — first and foremost, that's really what I enjoy. And then, secondly, because most of you guys thought I couldn't do it. So that's pretty fun. Is this something that you could grow perhaps to love as much as scoring? I can do it, man — I'm like Neo out this mother[expletive]. Yeah, I enjoy doing it. Like, when I prepare for each game, I look strategically at where the defense is going to be coming from, how to put guys in the right place to be successful. Y'know, my idol was Magic [Johnson] growing up, man, and I just so happened to not grow to 6'9". After that, once I realized I wouldn't be 6'9", man, that was the end of that dream. If you had really wanted it, how good a point guard do you think you could've ended up being? What, you think I'm gonna sit here and say I wasn't gonna be the best? [My strengths would've been] exactly what you're seeing tonight, man. That's what it would've been. When I focus in on something, I become obsessed about it, and I want to be perfect at it. That's just my personality. So if I was to be a point guard, I'd just obsess over it and wouldn't stop until I get it absolutely right. Is it what you're obsessed about now? First thing's first: Someone's going to have to break this to Mario Chalmers and find out if it changes his personal top-10 list at all. I'm guessing no, but we should double-check these things. Can't be too careful in a post-Te'o world. It's what makes him Kobe Bryant. That and the jaw-jut. Which, not coincidentally, he's pretty sure he's the best at, which has always made relationship with Sgt. Slaughter a little frosty. Thirdly: Kobe Bryant thinking he is a genius computer hacker who uncovers the truth about reality through his smarts, trains himself how to be the greatest warrior in the "real" world faster and more completely than any other warrior in history, then actually becomes not only a better warrior but basically a god by sacrificing himself which ultimately reveals his true nature, which allows him to do stuff like stop bullets and fly, is basically too perfect. Also, the Trinity/Triangle links can't be ignored. Fourthly: You can see that Bryant's kind of obsessed with playing point guard — or at least, his version of point guard — right now. Sure, some of the assists have seemed like stat-seeking — I'm thinking specifically of a two-on-one fast break during the first quarter last night where Bryant had an open deuce but seemed to recognize he could get an assist and kind of layup-lobbed it to Dwight for an awkward slam — but by and large, Bryant has seemed much more interested in moving the ball and getting his teammates involved, and the results have been impressive. Seven Lakers have scored seven or more points in each of their last three wins, 72.4 percent of their made field goals have been the result of direct assists, and they've shot 42.4 percent from 3 as increased ball movement creates more open looks. Granted, two of the three wins came over the Hornets and Utah Jazz, two of the six worst defenses in the NBA, and the Lakers owe Tuesday's win in large part to abysmal New Orleans second-unit play that allowed a 17-0 run spanning the late first and early second quarters, and a 7-0 run late in the third that pushed the L.A. lead back to double-digits, but still, wins are wins, and for a 20-25 team that's still four games out of a playoff spot, every little bit of momentum and flow helps. It's not all Kobe by any means — Howard diving hard to the rim matters, Gasol showcasing his touch and readiness to fire quick high-low touch passes to cutters matters, Nash being willing to play a more limited role that showcases his dead-eye shooting and makes defenses pay for collapsing elsewhere (as on the late fourth-quarter play where Bryant posted, drew a double and fired a skip pass to Clark, who attacked Ryan Anderson's closeout to draw a defender helping off Nash, who was wide open for 3) matters, and getting good minutes from reserves like Jamison, Jodie Meeks and the just-returned Steve Blake matters. In [the] 14 games [in which Bryant has notched three assists or fewer], the Lakers have allowed 108.2 points per 100 possessions, a defensive rating that would rank dead last in the NBA. But in games in which Bryant gets eight or more assists? That defensive rating improves to 100.1 points per 100 possessions. Now we're talking. This is where it gets interesting. Are we really to believe that the Lakers' defensive success varies according to how much Kobe passes? During ABC's broadcast of the Thunder-Lakers game on Sunday, analyst Jeff Van Gundy said players feel more motivated to play defense when they're getting their shots on the other end of the floor -- and in L.A.'s case, the numbers actually seem to support that. The games in which Kobe gets fewer assists are also the games in which the Lakers play lousy defense. So, keep your teammates happy and they'll keep playing for you, huh? Like letting ol' Neo there slide to lead guard, it sounds like a theory just crazy enough to work.